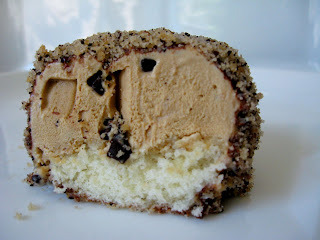 Nads' Bakery: Scream for Ice Cream? well, maybe not so much after as it was while I was making it.. in my head.. with a bit of cursing. It's an individual ice cream cake that I made for my brother's birthday. He loves ice cream cake so I thought it would be great to combine the convenience of a cupcake with his love of ice cream cake. What I had pictured in my head was much more elegant and chic than what had been produced. I imagined a perfect truncated cone (just imagine a cone with the pointy end cut off) with a thin coating of chocolate ganache. 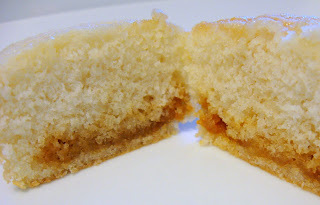 It would have been garnished with a thin border of a crumb mix made from the remnants of cake. But.. no such luck. The end product looked like more like what Korean's call "Joo Muk Bap," which literally means, "Fist Rice/Food" because it's a ball of riced shaped with your hands. 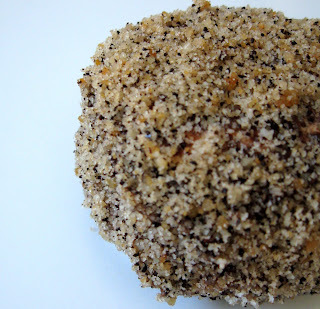 It's then coated with crumbs of dried seaweed and/or toasted sesame seeds. 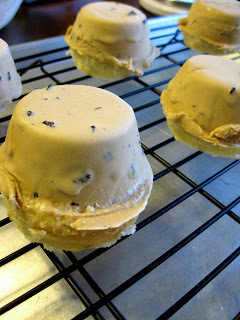 The following pictures are a result of my attempt at this individual ice cream cakes. 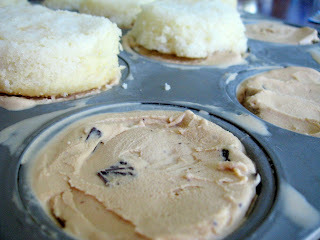 I used 2 pints of Starucks ice cream: Java Chip and Caramel Macchiato. Both quite yummy.. but only because I love ice cream and coffee. 2 Pints made exactly 12 individual cakes. 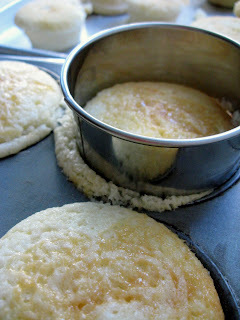 For the cupcakes I just buttered and dusted the pans instead of using muffin cups. 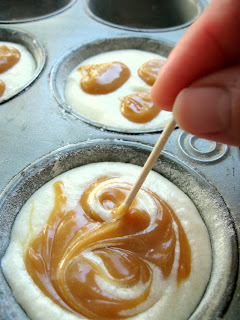 I added caramel to the batter in hopes to create lovely swirls to the cake. 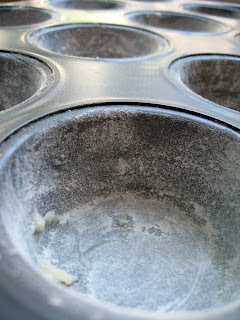 I think it'll work if I mix it into a small batch of the batter and do the same thing. 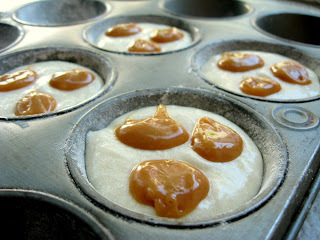 The caramel alone is too heavy to hold up in the baking process. I over filled just a little bit so I trimmed the tops with a round cutter. I cut the cupcakes in half but I think maybe it might have been ok to leave it too. Unmolded.. but not as pretty as I had hoped. 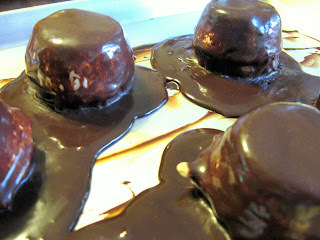 Then.. the disastrous ganache glazing. The ice cream was way too soft and I think the glaze was the result of my laziness. I used Nestle semi-sweet chocolate and half and half. 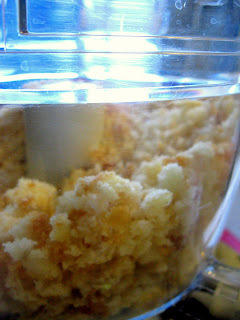 When I poured it over the ice cream.. it started breaking. Don't really know what exactly made it do that. 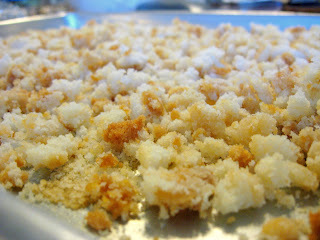 Left over cake crumbled and baked again to get it crispy. 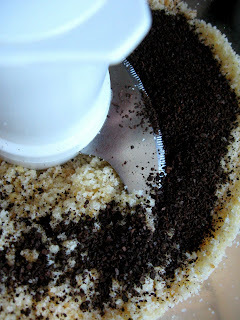 With coffee ice cream I thought coffee grounds might be a cool twist to add to the crumb. Tasted fine but looked a hot mess. so i finally get to see pictures of the birthday ice cream cake.